A Sicilian pizza that's as close as you're going to get to the famous one at Prince Street Pizza in New York City. The Spicy Spring from Prince Street Pizza, with its thick, olive oil–infused crust; spicy tomato sauce; mozzarella and Pecorino Romano cheese; and crisp-edged pepperoni, is an insanely good pizza with only one real problem: It doesn't exist anywhere else. No longer. Here's how to make that pizza anywhere in the world. Using the food processor for dough very rapidly builds up an elastic gluten network for good texture. Letting the dough rise in a pan coated with olive oil ensures that it doesn't stick while baking and that it acquires a crunchy, golden-brown crust. Layering the cheese under the sauce prevents the crust from getting soggy. Natural-casing pepperoni curls as it bakes, giving you textural contrast from the crispy edges. To Make the Dough in a Food Processor (recommended): Combine flour, salt, yeast, 0.35 ounce olive oil, and water in the bowl of a food processor fitted with the blade or dough blade attachment. Process until a dough that rides around the blade forms, then continue processing for 30 seconds. Continue with Step 4 below. To Make the Dough in a Stand Mixer: Combine flour, salt, yeast, and 0.35 ounce olive oil in the bowl of a stand mixer (see below for mixer-free version). Whisk to combine. Fit mixer with dough hook attachment. Add water to mixer and mix on medium speed until dough comes together and no dry flour remains. Increase speed to medium-high and mix until dough is stretchy and smooth, about 6 minutes. The dough should stick to the bottom of bowl, but pull away from the sides. Continue with Step 4 below. To Make the Dough Using the No-Knead Method: Combine flour, salt, and yeast in a large bowl. Whisk to combine. Add 0.35 ounce olive oil and water and stir by hand until dough comes together and no dry flour remains. Cover bowl tightly with plastic wrap and let rest at room temperature for 12 to 24 hours. Continue with Step 4 below. Pour remaining 1/4 cup olive oil into a 13- by 18-inch rimmed baking sheet and spread over entire inner surface with your hands. Transfer dough to baking sheet and turn in oil until thoroughly coated. Spread gently with your hands. (It will not stretch to fill the pan; this is fine.) 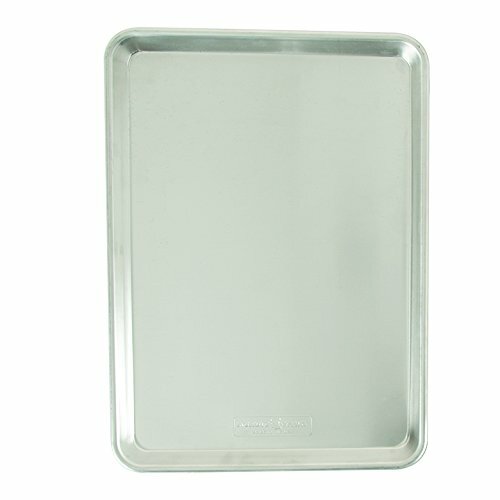 Cover baking sheet with plastic wrap and allow to rise at room temperature until dough has slackened and started to spread out toward the edges of the pan, 2 to 3 hours. Carefully remove plastic wrap from pizza dough. Using oiled hands, and working as gently as possible to maintain air bubbles, push and stretch dough into the corners of the pan by pressing out from the center, lifting each corner, and stretching it beyond the edge of the pan. It should pull back until pan is just filled with dough. Set aside for 20 to 30 minutes while you make the sauce. For the Sauce: Heat olive oil in a large saucepan over medium heat until shimmering. Add garlic, oregano, and red pepper flakes and cook, stirring, until softened and aromatic, about 1 minute. Add tomatoes. Using a pastry cutter or a potato masher, break up tomatoes into fine chunks. Stir in sugar. Bring to a bare simmer and allow to cook for about 15 minutes to let flavors meld. Season to taste with salt. Set aside and allow to cool slightly. Thirty minutes before baking, adjust oven rack to lower position and preheat oven to 550°F. To Assemble and Bake: Spread slices of mozzarella cheese evenly over surface of pizza. Spoon sauce on top of cheese and spread with the back of a spoon. (You will not need all the sauce; use as much as you like, but be sparing.) Spread pepperoni slices evenly over surface. Sprinkle with half of Romano cheese. Transfer to oven and bake until pepperoni is crisp and curled and bottom of pizza is golden brown when you peek by lifting the corner with a thin spatula, about 10 minutes. With some ovens, you may need to loosely tent the top of the pizza with aluminum foil and continue baking until the bottom is golden and crisp. Remove pizza from oven. Sprinkle with remaining half of Romano cheese, use a pizza wheel to cut it into slices, and serve immediately. All dough quantities are given in mass measurements (ounces, not fluid ounces). For best results, I strongly recommend using a precise scale, set to either ounces or grams, to weigh out dough ingredients. If using a food processor, you can place the food processor bowl directly on the scale and tare it, then add the ingredients directly to it. To get pepperoni that curls as it bakes, look for a high-quality natural-casing, stick-style pepperoni and slice it yourself. Check out our taste test for recommended brands.